After twenty years since the first generation Nissan Altima made its appearance on the automotive market the 5th generation Altima is approaching the finish line, supposedly bringing with it what we all expect from a sedan these days: great value, comfort, modern design and up to date technologies. 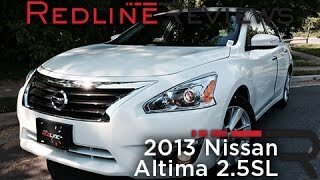 The Nissan Altima 2013 has made its debut during this year's New York Auto Show so let's take a look at what the latest model intends on bringing to the table for the 20th year anniversary of the Altima name plate. The Nissan Altima 2013 comes with two engine variants, a 2.5 liter and a 3.5 liter V6. While the 2.5 liter DOHC 4-cylinder engine develops roughly 182 horsepower, the beefier 3.5 liter V6 engine is able to produce around 270 horsepower. Both the 2.5 and 3.5 liter engines are paired with a significantly updated Xtronic CVT gearbox. As far as fuel efficiency goes Nissan claims that the 2.5 liter Nissan Altima 2013 is able to cover roughly 27 mpg city and 38 mpg highway. The 3.5 liter engine on the other hand will have an estimate fuel efficiency of 22 mpg city and 30 mpg highway. 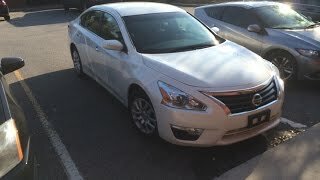 Although the Nissan Altima 2013 is slightly bigger than the previous model in both length and width, the wheelbase remains the same and interestingly enough, the entire car weights 79 lbs less than its predecessor. Furthermore the Nissan Altima 2013 has been equipped with a completely redesigned 4-wheel independent suspension alongside an Active Understeer Control for improved handling and a better ride. The exterior of the Nissan Altima 2013 looks very much up to date and well detailed, but we're not sure whether or not the new Altima will indeed shake the mid-size sedan segment by "delivering the most innovative and stylish vehicle in its class", as Nissanclaims. On the interior the fifth generation Altima delivers a wide range of interesting features including the NASA-inspired "zero-gravity" front seats and leather appointments. As standard the new Nissan Altima comes with Bluetooth Hands-Free Phone System and in the center of the instrument cluster resides an Advanced Drive-Assist Display able to show navigation information, audio data as well as text messaging notifications. Other optional extras include the NissanConnectSM and NissanConnectSM Navigation system featuring hands-free text message integration, Google POI search, Pandora Playback, blind spot and lane departure warning, easy fill tire alert and moving-object detection. 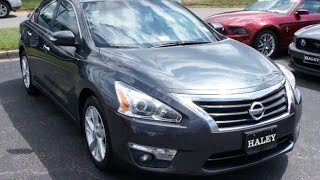 The Nissan Altima 2013 will be made available in seven distinctive variants in order to meet the needs and different budgets of a larger number of customers. The exact price-tag of the Nissan Altima 2013 has not yet been made official, but the expected price is similar to that of the Chevrolet Malibu or the Ford Fusion.